This text is principally intended to be used by students and teachers of echocardiography, although it is anticipated that all Echo practices will find it to be a useful educational guide and resource. 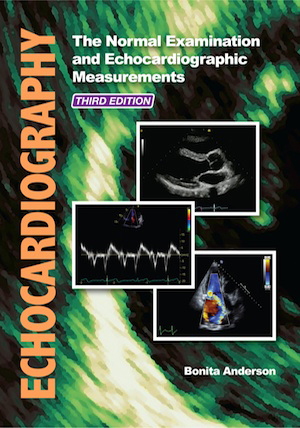 Chapters cover the basic principles of ultrasound imaging and Doppler techniques as well as the echocardiographic examination, with respect to standard echocardiographic images and views, image optimisation and echocardiographic measurements. Precise details of measurement techniques and their limitations are included. Numerous “Practical Examples” are also incorporated to illustrate the clinical application of various echocardiographic calculations along with additional “Technical Tips” showing examples of common measurement errors and ways to avoid them. Key points are emphasised in numerous information panels scattered throughout the text. Since the release of the first edition of “Echocardiography: The Normal Examination and Echocardiographic Measurements” more than 16 years ago, the popularity of this title has risen to see it become a core text for schools and students of echocardiography worldwide. It can also be found in many echocardiographic laboratories where it is used as a reference tool and in the ongoing training and development of cardiac sonographers and registrars. The basic structure of this third edition remains essentially the same as the second edition with chapter themes and topics remaining unchanged, although reference values and other essential information have been updated. New images, extra tips and clinical examples have also been added, which are all aimed at furthering the reader’s understanding of this fascinating field. Click the Real Time Images link to view moving echo images corresponding to figures in the book. For the THIRD EDITION ONLY: Click on the links below to open a new window that displays real time images for that chapter. Please refer to the appropriate figure legends within the book for details. We are pleased to present reviews of the book below. Readers comments may be posted on this page as they become available. If you would like to make a comment on the book, please use the form on the Contact Us page. Publication: ECHO, The Journal of The British Society of Echocardiography, Issue 97, May 2017. Written by: Chris Attwood, Head of Cardio-Respiratory Department, York Teaching Hospital NHS Foundation Trust. Fresh off the press for 2017 this 3rd edition of this reference textbook does exactly what the author Bonita Anderson set out to do. Spanning 15 chapters this textbook covers the basic principles of adult transthoracic echocardiography, and addresses the theory, practical aspects and limitations in detail. When it comes to advanced echocardiography techniques the book covers the subject of strain imaging briefly, however there is no 3D or contrast echo content. In my opinion a good text book should provide the information you need in a manner which is both easy to read and understand. Bonita Anderson’s book is a shining example of this being done well. The layout of this edition is very easy on the eye. Pages are well structured and not cluttered and provide tables, still frame echo images and schematics clear all of an excellent quality. 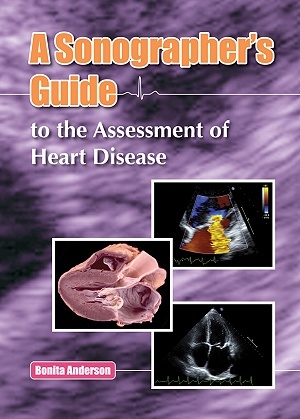 Each chapter covers a different fundamental topic of echocardiography, and presented in a logical manner. I was particularly impressed with the first chapter titled “Basic Principals of Two-Dimensional Ultrasound Imaging”. This chapter covers ultrasound physics and discusses how they relate to practical image optimisation. It is covered in depth, but is not a ‘heavy read’ and would be an excellent starting point for anyone working towards BSE accreditation or simply beginning a career in echocardiography. We had the original edition of this book in our department and, although a great book in its own rite, there have been some excellent additions to this third addition which work really well. The book uses panels and information boxes to highlight ‘key points’ from the main text, and to provide the reader with practical examples for calculations such as fractional shortening. There are also page long ‘Technical Tip’ sections which take the reader through how in practice measurements should be taken, the pitfalls of the measurement and how to avoid them. As mentioned earlier the only things missing from the book are 3D and contrast echo content along with a more in depth look into strain imaging. This could be viewed as a negative, however I would argue (as the author rightly states in her foreword) the book is aimed at providing students and teachers with the fundamentals of echocardiography, and the content is expertly weighted towards achieving this goal. In summation If you are looking for a textbook covering more advanced echo techniques in detail, this book will not provide this for you, but that is not what it was aimed to do. This is a well written, in depth text book which covers the fundamentals of echocardiography, and in my opinion would be an excellent source of reference material for any echocardiographer. Retailing at £90 on Amazon, I would highly recommend this textbook as a quality edition to any departments echo reference literature. Publication: AJUM (Australasian Journal of Ultrasound in Medicine), May, 2017. Written by: Dr Sandhir B. Prasad MBBS FRACP FCSANZ. Senior Echo-cardiologist, Royal Brisbane and Women’s Hospital and Mater Hosptial Brisbane. Senior Lecturer University of Queensland. Associate Cardiac Editor for AJUM. It is a ‘humbling’ privilege, not to mention a daunting task, to be asked to review the latest edition of Bonita Anderson’s seminal textbook on echocardiography. As a registrar training in echocardiography, I remember swotting up on the first edition to learn ‘everything I ever needed to know’ about the normal echocardiographic examination, and I think every registrar or sonographer training up in echocardiography in Australasia would relate a similar experience. Now in its third edition, this textbook has become ‘the textbook’ for trainees in echocardiography and an essential component of the reading lists onmany training courses, including, but not limited to, the Diploma in Cardiac Ultrasound offered through the Queensland University of Technology and Diploma in Medical Ultrasound offered through ASUM. The latest edition incorporates several features that update the second edition. Reading through the textbook, the most important update that stood out has been the incorporation of the latest guidelines on chamber quantification into the text. These guidelines, released in 2015, as a joint effort between the American Society of Echocardiography (ASE) and the European Association of Cardiovascular Imaging (EACVI), contain a number of important differences from the previous iterations, particularly in terms of left ventricular wall thickness, left ventricular ejection fraction cut-offs and left and right atrial measurements. A detailed review of the text and tables in the latest textbook shows that all these changes are incorporated and hence representative of the latest guidelines. The assessment of RV systolic function has also been expanded in line with the new guidelines. Contemporary assessment of left ventricular function now incorporates newer technologies such as three-dimensional echocardiography and left ventricular strain. In the latest textbook, there is an excellent chapter on strain, including both tissue Doppler-based strain and speckle tracking, which was a pleasure to read in that complex concepts are explained in simple terms, the illustrations are extremely instructive and the coverage of this topic is comprehensive. Whilst the clinical applications of strain are not discussed in detail as it is clearly beyond of the scope of a textbook focussed on the ‘normal’ examinations, there is an excellent figure illustrating its value in cardiac amyloid and apical hypertrophic cardiomyopathy in chapter 14. Students will find this an ideal summary introduction to strain. The chapter on the assessment of diastolic function presents a comprehensive approach to assessing diastolic function. Basic diastolic physiology is summarised in simple terms and again illustrates this textbooks’ ability to capture and explain complex processes in simple terms and in a short space. The parameters incorporated into the tables include the full suite of measures that are available for diastolic assessment, including pulmonary venous inflow and flow propagation velocity. The reader will find themselves fully versed with a comprehensive and multiparametric approach to diastology at the end of this chapter. There is also a short summary of the assessment of right ventricular diastolic function at the end of the chapter on diastolic function. The textbook comes along with added Internet content and features, giving it a real web-age dimension. Real-time images of many of the illustrations in the textbook can be found online (www.echotext.com). The website is easily navigable, being organised according to the corresponding chapter, and the playback is of a high quality with excellent image definition. The images have to be read in conjunction with the figure legends in the textbook. The website contains a number of excellent presentations as well in a video format with Ms Anderson’s voiceover on Cardiac Embryology, Cardiac Tamponade, Quantification of Valvular Regurgitation and Takotsubo Cardiomyopathy. File sizes are specified at the end of each presentation to help estimate loading times, and there is a promise of ongoing new content in the form of newer presentations in the future. There is also a link to email the author with questions incorporated into the website. In addition to the major updates discussed above, the basic structure of this third edition remains essentially the same as older editions with chapter themes and topics remaining unchanged. Updated reference values for many of the chapters, especially for chamber dimensions as noted above, make this a more contemporary and up-to-date textbook. There are many new images, extra technical tips and clinical examples included in this edition. In summary, the latest edition of this respected and seminal textbook provides a contemporary textbook with updated reference values, added content incorporating latest technological advances and a range of associated web content. In common with previous editions, it is thoroughly well organised and very readable. As a textbook aiming to provide a comprehensive coverage of topics relevant to the normal echocardiographic examination, it is a worthy successor to its previous editions, which were also excellent, and remains an essential textbook for all doctors and sonographers practising echocardiography. Virtually every echocardiographer in Australasia who has obtained accreditation in the last 16 years has done so with the assistance of this textbook. Previous editions were published in 2000 and in 2007, so it is likely that the edition currently sitting in your Echo clinic is starting to look a little worse for wear after years of frequent use. The guidelines and recommendations for echo are continually evolving, so it is time to retire your earlier edition and replace it with the up-to-date 2017 version. If you are currently a student, you can expect that your next exam may include images from the new 3rd edition. Bonita has a true gift for teaching – she delivers detailed explanations in clear language with excellent use of illustrations, photographs, diagrams and video footage (illustrations labelled with a back arrow reference online videos that can be viewed at www.echotext.info). The layout is really helpful as she uses colour and text-boxes to help you find your way around the page and be efficient in targeting the information you need without getting overwhelmed. The 3rd edition explains the technical aspects of each of the modalities and views used in routine clinical practice. Less routinely used techniques such as 3D echo and contrast are not included, and strain imaging is only briefly covered. M-mode, 2-D, Spectral Doppler, Colour Doppler, stenosis, regurgitation, systolic function and diastolic function are each addressed in individual chapters. You will learn how to get the best views, know what pathologies can be detected in each view, and understand the correct techniques for obtaining measurements. Bonita makes a point of including the significance and limitations of each method. She also lists common mistakes and how to avoid them – which is especially helpful to those of us who are learning how to train others. Another feature which makes this textbook very user-friendly is the summary of key points at the end of each section. As you make it to the end of a topic you get the essential points reinforced in your memory. This approach also enables sonographers to efficiently refresh their knowledge as required. In addition, the index is very comprehensive, so this is an invaluable textbook to keep onsite in your clinic for day-to-day reference. I recommend that beginners should study this book prior to approaching Bonita’s other textbook “A Sonographer’s Guide to the Assessment of Heart Disease (published in 2014). Experienced sonographers will find themselves referring to the heart disease text for specific pathologies, and referring to the normal examination text for specific measurement techniques. I compared the two texts by looking at how each addressed the topic of pulmonary hypertension: the assessment of heart disease text gives more information about the disease pathology and provides reference values for all the relevant echo measurements in one section, whilst the normal examination textbook spreads its discussion of the relevant measurements across several chapters and provides far more tips and tricks for technical accuracy. Between the two textbooks a sonographer will know how to accurately obtain each piece of the puzzle and will then also be able to put the whole jigsaw together so that the bigger clinical picture is obtained and understood. Disclosure: the author of this review was provided with a free copy of the text. Written by: Santina A. Ampt, Bass Coast Provincial and Diamond Valley Cardiac Imaging Services, Melbourne, Australia. Like previous editions, this textbook is designed to provide the basics of echocardiography for use by student cardiac sonographers and clinical supervisors. 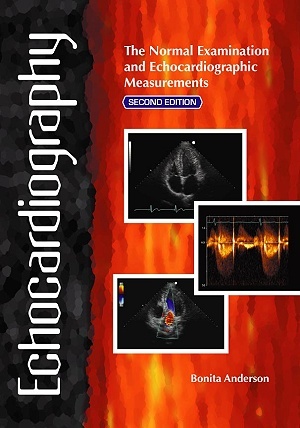 However, the book is a useful resource for a wider audience interested in echocardiography scanning. 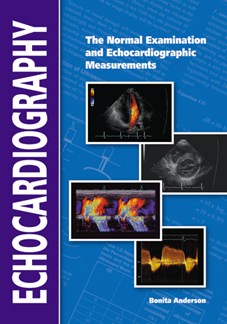 The new edition contains the same chapters and topics as the previous edition, covering principles and techniques used for echocardiography such as standard acoustic windows and views, and measurement of Doppler and other echo parameters. There are also a number of new features. Reference values have been updated, and new images have been added to demonstrate the information being presented. In particular, text boxes with examples and diagrams are very handy and easy to understand. This is a well-referenced textbook with sources from well-respected leaders in the field from a great variety of countries. A database of images will also accompany the book on the publisher’s website, www.echotext.info. • Inclusion of complete image sets in some examples to provide more contexts. Extra images and applications of subcostal IVC scanning would be particularly helpful in some cases. • A more streamlined approach to the physics of ultrasound. While it is important for sonographers to have a working understanding of ultrasound physics and the derivations of formulas used, there is much more physics content in this book. • An expansion of the area on bio-effects and safety to include sonographer safety. A discussion of the correct ergonomics of scanning could potentially reduce scanning-related sonographer injury. • Updating some of the seminal, but dated, references cited if possible. Overall, this is an excellent reference book that would be a valuable resource in any echocardiography department, for the ongoing training and development of cardiac sonographers and registrars. As hard as we try to make our publications perfect in every way, there is always the possibility that some errors may be missed before going to press. Also, new information can emerge that can make a change necessary. Unfortunately, once a book is printed and distributed, it is all but impossible to rectify this situation other than to bring any updates to the attention of those who care to stay in touch. In the interests of our readers and all others concerned, we intend to report any significant errors on this page of our website, if and when they come to light. For this reason, we advise that buyers of the book check this website regularly to remain up-to-date. If you have a copy of the book and would like to report an error, please proceed to the Contact page and submit details for our investigation. Page 109: In Table 6.16, the units for Peak E and Peak A should be in m/s (not cm/s). Page 169: Table 9.5 Normal Reference Limits and Abnormal Values for Selected RV Measurements. The units for the following measurements should be in mm: RV basal diameter, RV mid diameter, RV length, RV wall thickness, RVOT PLAX diameter, RVOT proximal diameter and RVOT distal diameter. Page 245: In Practical Example 12.6, Equation 12.20 is mistranscribed. This should be P½t = 0.29 x DT. Therefore, P½t = 0.29 x 516 = 150 ms.